Bluetooth is a low-energy data-transfer technology which replaces conventional wires with short-range radio signals. It is the technology that fuels the ‘hands-free’ function. It differs from the earlier DECT (Digital Enhanced Cordless Telecommunications) in range, connectivity and security. Bluetooth can carry out many functions, including image and data transfer, wireless printing and streaming of stereo. Bluetooth is most commonly used in the contact centre with Bluetooth headsets. They replace the corded telephone with a hands-free, streamlined alternative, which complements the host telephony system. Bluetooth headsets enable call centre agents to take calls efficiently, as they can use their hands for different tasks, such as data entry. Bluetooth is important in call centres because it allows agents to work freely with their hands while they are engaged in a phone call and means that customer enquiries can be handled using their data on a computer. The hands-free headset is brilliant for moving around. This means that it can be used by both agent and supervisor. The supervisor can monitor the sales team and is also able to respond to calls away from their desk. For the agents, it enables them to move around their desks and stand up. Small things like this can improve agent happiness at work. A good headset contributes towards the productivity and efficacy of agents’ call times and number. There are different styles of headsets: monoaural (one ear piece), binaural (two ear pieces), with overhead, behind the neck, or in-the-ear earpieces. There is boom arm, which can be noise cancelling, which creates the illusion that the agent is in a calm, quiet environment, not in a busy and noisy room. Both the earpiece and boom arm contribute decent audio quality, which is needed for both the agent and the customer. 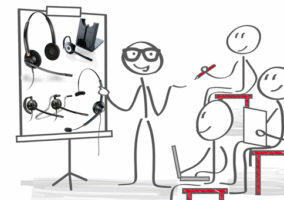 Noise-cancelling headsets are important for contact centres. In a poll (https://www.callcentrehelper.com/poll-how-noisy-is-your-contact-centre-67214.htm) carried out in May 2015 (59 responses), 22% of respondents said that their call centres were noisy, with the majority of those polled stating that the contact centre was occasionally noisy. 0% said that their contact centre was quiet. These stats highlight the need of effective noise-cancelling technology, as it can be invaluable to how the contact centre appears to callers.